To insert an equation using the keyboard, press ALT+ =, and then type the equation. You can insert equation symbols outside a math region by using Math AutoCorrect. For more information, see Use Math AutoCorrect rules outside of math regions check box. You can also create math equations using on the keyboard using a combination of keywords and math autocorrect codes. New to Word for Office 365 subscribers is the ability to type math using the LaTeX syntax; details described below. Linear format is a representation of math on one line in documents. There are two linear formats for math that Word supports:. Depending on your preferred input format, you can create equations in Word in either one of UnicodeMath or LaTeX formats by selecting the format from the Equations tab. Note: All the other Office applications support only UnicodeMath linear format. Enter your equation using Alt + = on the keyboard. Choose Convert and select professional to build your typed fractions to their Professional form into subscripts, or use Ctrl + =. You can similarly convert an equation back down to a linear format with Ctrl + Shift + =. 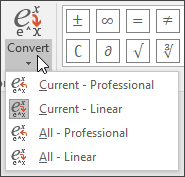 Note: Convert a professional format equation format to it's source format, change the convert tool to build a linear format by selecting the desired option from the Convert menu. UnicodeMath resembles real mathematical notation the most in comparison to all of the math linear formats, and it is the most concise linear format, though some may prefer editing in the LaTeX input over UnicodeMath since that is widely used in academia. Note: When an example is followed by two consecutive spaces, the first space resolves the typed text into the equation, and the second space builds it up. Microsoft Office uses the linear format described in Unicode Technical Note 28 to build up and display mathematical expressions. 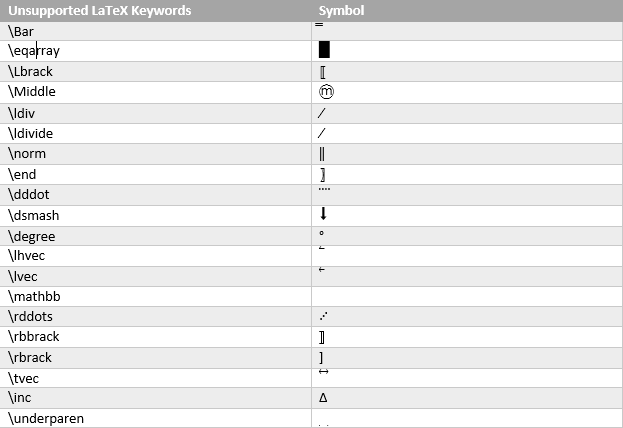 For more information, including how to quickly type up and build equations, see Unicode Nearly Plain-Text Encoding of Mathematics. Here are some other examples of LaTeX expressions that can be built-up into a professional format. 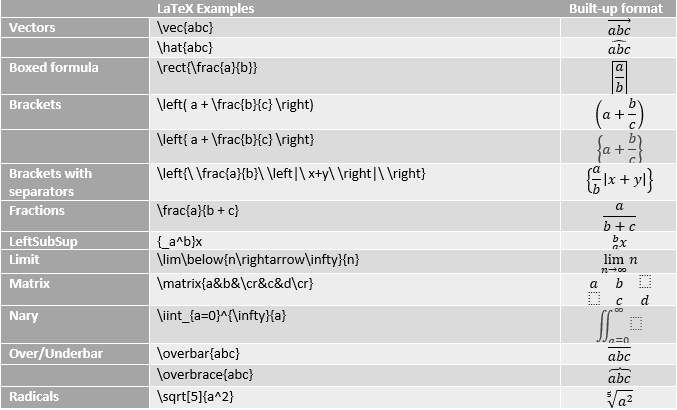 Most LaTeX expressions are supported in this new feature to Word; a list of exceptions is provided below for LaTeX keywords that are not currently supported. Some LaTeX expressions take a slightly different syntax than might be expected﻿. 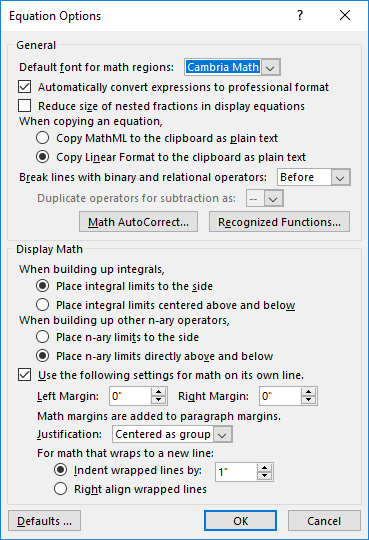 Office has Math AutoCorrect that can be used to make UnicodeMath format simpler by automatically recognizing expressions and symbols as they are input and converting them to a professional format as the equation is created. This setting can be enabled or disabled by checking the appropriate box in the Equation Options dialog. Type one of the following codes followed by a delimiting term. For example, after you type a code, type a punctuation mark, or press SPACEBAR or ENTER. To ensure that the Math AutoCorrect symbols appear the same in your document as they do in the AutoCorrect dialog box, on the Home tab, in the Font group, select Cambria Math. Important: The codes are case-sensitive. Note: For information on inserting a symbol that is not in the chart above, see Insert a check mark or other symbol. Click the Math AutoCorrect tab. Select the Use Math AutoCorrect rules outside of math regions check box.